A 73-year-old male patient with a history of coronary artery disease (stent) was attended to our emergency service with a clinic of acute onset noncooperation, agitation, and unconsciousness movements. During examination, the patient was yelling, his speech was meaningless, characterized by nonsense and garbled sounds. On neurological examination, he could open eyes spontaneously, but he was noncooperative. There was no motor deficit. Other examinations, including sensory and cerebellar functions, could not be performed due to the cooperation problems. Nuchal rigidity was absent. Cranial computed tomography was in normal ranges. However, with a provisional diagnosis of stroke (based on the acute onset of symptoms), cranial diffusion-weighted imaging (DWI) was also performed 3 h after the onset of clinical manifestations, which did not show a signal of diffusion restriction [Figure 1]. Laboratory examinations including hemogram (white blood cells: 8700/mL, hemoglobin: 10.3 g/100 mL, and platelet: 224,000/mm3), biochemistry, thyroid-stimulating hormone, activated partial thromboplastin time, and international normalized ratio were in normal ranges. Therefore, a proper diagnosis could not be established and further investigations (electroencephalogram, contrast-enhanced magnetic resonance imaging [MRI], and lumbar puncture) were planned in the following course and hospitalization was recommended. However, the patient's relatives refused further examinations and inpatient treatment. Hence, they were discharged after obtaining a signed informed consent form that they accept the risks. However, the patient was brought to the emergency department 2nd time the following day by his relatives, due to the persistence of the same symptoms. Cranial DWI was reperformed (40 h after the symptom onset) which showed diffusion restriction in the left middle cerebral artery (MCA) territory [Figure 2]. Aspirin was initiated and the patient was hospitalized for the etiological investigations of stroke. Brain/neck tomography angiography and electrocardiography were in normal ranges. Echocardiography showed mildly systolic dysfunction. However, the patient had to be intubated due to respiratory failure and CO2 retention as well in the following course. During the following 3-week period, he could not tolerate extubation. Hence, tracheostomy was performed and the patient was transferred to the palliative care unit with a neurological status of minimally consciousness state. DWI is a critical tool for the diagnosis of acute stroke, such that it enables detection of ischemia minutes after the symptom onset, with a sensitivity between 88% and 100%. However, with advancing experience and the results of the clinical trials, the reliability of DWI in detecting ischemic lesion has begun to be questioned. Based on the results of these studies, some clinical clues such as posterior circulation stroke, single small-sized lesions, early recording time of DWI, and nondisabling stroke (low National Institute of Health Stroke [NIHSS] scale) have been emphasized as risk factors for negative DWI results.,, However, cases of large vessel infarction with initial negative DWI have rarely been reported in literature., In a unique report by Wang et al., an 87-year-old patient presenting with acute severe neurological deficit (NIHSS score: 22) was illustrated. Initial DWI of the brain within 27 h of symptom onset was negative; however, the second DWI on the 7th day from admission had showed infarct throughout the left MCA and anterior cerebral artery distribution, with restricted diffusion. In another report by Szabo et al., 13 ischemic stroke patients with false-negative DWI were reported. Remarkably, all of these patients had presented with severe acute focal neurological deficits (NIHSS score of ≥8) and initial negative DWIs had been recorded within 8 h of symptoms onset. In our article, we again report a smart sample of these strictly rare illustrations with large vessel stroke in which initial DWI was unremarkable. However, the second DWI showed massive restricted diffusion in the left MCA territory. Based on this rare presentation, we draw attention to the importance of multimodal evaluation for proper diagnosis of acute ischemic stroke, and we question the reliability of DWI as it can yield negative results initially even in large vessel occlusive stroke syndromes as in this case. Of note, the clinical presentation of our patient was characterized by consciousness alteration and agitation which was not typical for MCA syndrome making the diagnostic process further complicated. Considering that acute stroke therapy is a strictly time-dependent issue and invasive treatments such as thrombolysis may substantially improve the long-term prognosis of the patients; first, we emphasize to avoid MRI-based diagnostic approaches to prevent underdiagnosis of stroke. Perfusion imaging, as a further investigation, may be a crucial alternative method in these patients with suspicion of stroke, but negative initial DWI results. Future studies to clarify the risk factors and mechanisms of negative DWI results may add substantial perspectives to our understanding of the utility of DWI. The results of these studies may also help to develop the diagnostic approaches of acute stroke patients. González RG, Schaefer PW, Buonanno FS, Schwamm LH, Budzik RF, Rordorf G, et al. Diffusion-weighted MR imaging: Diagnostic accuracy in patients imaged within 6 hours of stroke symptom onset. Radiology 1999;210:155-62. Oppenheim C, Stanescu R, Dormont D, Crozier S, Marro B, Samson Y, et al. False-negative diffusion-weighted MR findings in acute ischemic stroke. AJNR Am J Neuroradiol 2000;21:1434-40. Ay H, Buonanno FS, Rordorf G, Schaefer PW, Schwamm LH, Wu O, et al. 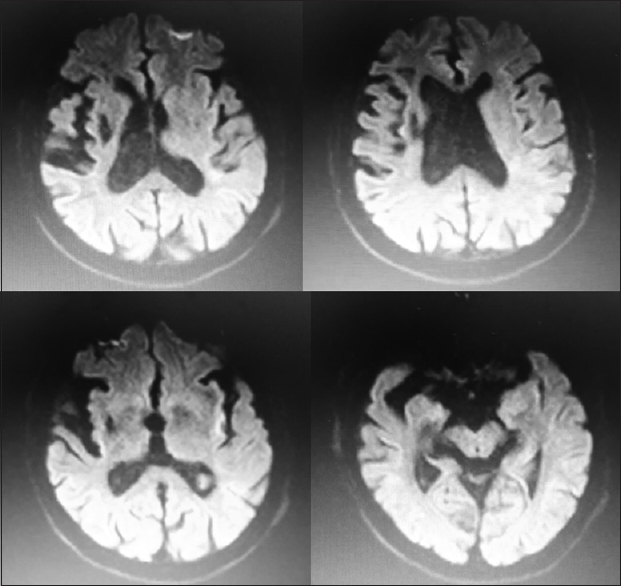 Normal diffusion-weighted MRI during stroke-like deficits. Neurology 1999;52:1784-92. Makin SD, Doubal FN, Dennis MS, Wardlaw JM. Clinically confirmed stroke with negative diffusion-weighted imaging magnetic resonance imaging: Longitudinal study of clinical outcomes, stroke recurrence, and systematic review. Stroke 2015;46:3142-8. 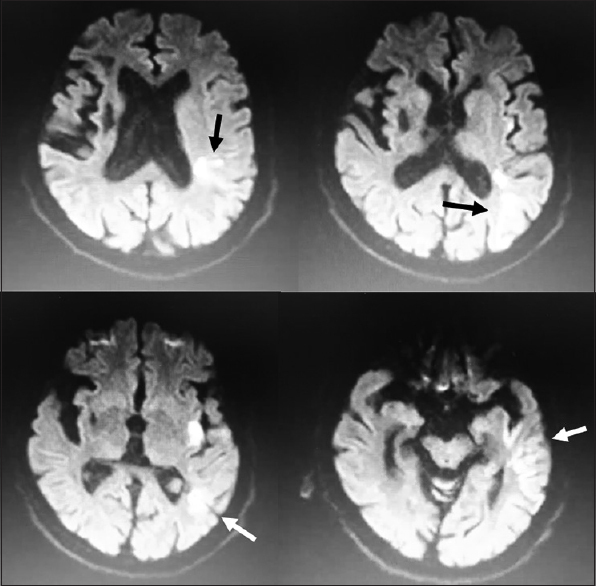 Aragão Homem C, Fonseca AC, Geraldes R, Pinho e Melo T. Brain magnetic resonance with negative diffusion-weighted imaging: Does it preclude acute stroke diagnosis? J Stroke Cerebrovasc Dis 2015;24:e251-3. Wang W, Goldstein S, Scheuer ML, Branstetter BF. Acute stroke syndrome with fixed neurological deficit and false-negative diffusion-weighted imaging. J Neuroimaging 2003;13:158-61. Szabo K, Kern R, Gass A, Hirsch J, Hennerici M. Acute stroke patterns in patients with internal carotid artery disease: A diffusion-weighted magnetic resonance imaging study. Stroke 2001;32:1323-9.